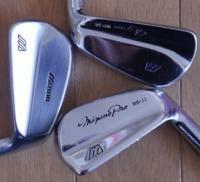 Discussion Bob Murphy Jr. vintage irons by whom...? These, full 2-9 set (and a Haig Ultra PW), came with a vintage, pink vinyl Hot-Z golf bag my wife wanted, with a 2-wheel folding pull cart with really wide, soft, light gray tires that look great with her bag. Neither of us golf on a "blades level" yet but I'm cleaning up and holding on to various cool vintage sets, as I have a bit of air conditioned storage space in my home I freed up. I also like to challenge myself with them intermittently while I practice, to see how far I am from sweet spot consistency, whether I supposedly have any business straying from my learner CB's yet or not (King Cobra II OS, a bit vintage in their own right). Sam Snead started with sticks and stones and so was still able to score a 76 with a fresh tree branch, so I want to push myself with what's hard sometimes (blades), early on, without getting discouraged enough to quit. It's driving me nuts; I can't remember where I saw that insignia before that looks like an "SR" but also a bit like little atomic orbital symbols. It can't stand for "Senior"(?) hehe as I suspect when these came out Bob Murphy wasn't all that senior, esp. back when he referred to himself as "Jr."...? **Aluminum shafts! 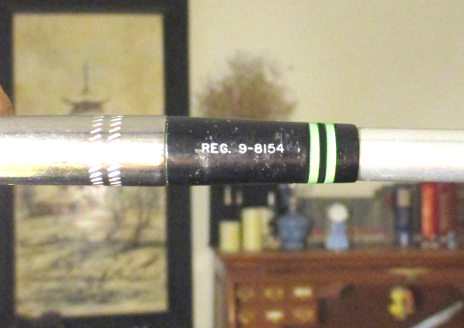 ** They have True Temper aluminum shafts... first acquisition of those! 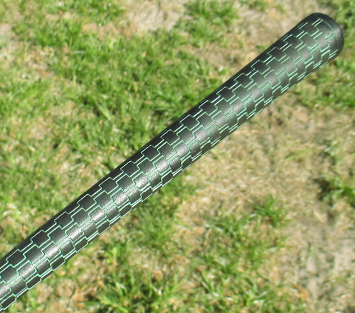 His Irish pride showing thru in the clover on the back, the green stripes on the ferrule, and Golf Pride even put green highlights in the original grips. There's nothing like a new grip, but when I'm reluctant (either a really cool-looking original grip or I'm not sure if I'll play it) I learned that rubbing a very, very thin film of Bag Balm into the rubber, wiping off any surface black rubber oxidation, grinding the Bag balm in really good, and wiping off any excess (don't want it slipping out of your hands like a movie) vintage grips get more supple and much, much more tacky (but without being prone to picking up dog hairs). Just say'in. But I know I'll feel stupid for not knowing who made these or whose insignia that is... thanks!! The "SR" stands for Sears Roebuck. Which is an endangered species. AH!!! Thanks for the "Sears" and the welcome. I certainly feel welcome asking that question and having it answered which wouldn't happen everywhere. "Endangered species" is right! Sears just went toes up. Plus I'm a Northwestern fan anyway, who I believe also appeared in Sears (and someone once even said Kmart). My whole return to golf happened when my dad gave me his 80's shallow cavity-back irons and a perfectly preserved Nautilus bag. I feel like I found the place where it will actually be worth my time to photograph and post my beloved acquisitions. two closets for quick, easy access. This set came by accident from Craigslist (classifieds) with a bag and cart for my wife but I so often go to the corner thrift store. I am currently struggling a bit financially so, for a while, must find fun with "lunch money" (the amount a kid would have in school, haha). One Goodwill (thrift store) is selling clubs for $4 each (no big deal, I bought a hybrid there, but for a whole set I could find a nice set on Ebay for $40) but the other Goodwill has any/all clubs for $1.18 !! I've dialed it back because, as a Christian, I realized I'd begun gambling on whether or not the rest of a set will appear soon, and I buy the incomplete set with those hopes. The gamble happens as: they hide all their new clubs in back in a pile and vehemently defend they cannot look or reveal what's still back there. When a bag of clubs comes in they dump them on the heap and sell the bag separate. Some apt clerks identify a whole set of clubs (at least irons!) at a time and place it out on the floor. Others just grab random clubs and set them out until the spots on the floor are all filled with "a club". When too many clubs pile up in back they grab some (either strategically or randomly, depending on the clerk) and send them off to other stores or even, I suspect, if they hung out too long, throw away or recycle them. Anyway -- the gamble is: if half of a cool set is hanging out, I may grab it in hopes the rest will appear in following days. But if they don't, I just have have a broken up set of (whatever) idiosyncratic, uncommon clubs. I'm not that concerned about 1i thru 3i and maybe even 4i if it's a cool set since it could still be used with a hybrid or so, or maybe even wedges or putter could be ok mismatched, but it outright stinks when you're missing somewhere between 5i and 9i. I have done this and hit jackpot and the missing club appears in 3 days on the floor, but the rest of the incomplete sets I'll have to take to the range one day and determine what might be a good match of leftover broken set makes/models to pair up with each other. I just know some of these incomplete sets have their missing clubs in back, being shipped off to goodness knows where... but I realized yesterday I was gambling, so I'll chill out on, at least, buying incomplete sets at GW. All in all I'll keep a few of my favorite sets and pass the rest on. I think aluminium shafts would date the set to between 1967-71. Certainly late Sixties and possibly the very early Seventies. Oh wow thanks -- that make so much sense... Mr. Murphy went pro and won 5 PGA Tour tournaments in 1967. While he did a lot of awesome stuff, this might be what got Sears Roebuck to want a signature club, around that time. Now that I know they're Sears Roebuck, and I look at at pics of their other clubs, these are pretty much the same as their Arnold Palmer clubs but without the little peak of extra weight raised up in the sweet spot like their SR Arnold Palmers (which remind me of Powerbilt Citations I already have, so I'd rather have the Murphys than the Palmers to feel the variety). I do like them and will hold onto them and break them out occasionally as I progress. I think they look pretty nice. A bit like Wilson button-backs. One other thing with aluminium shafts is that they have wider hosel bores, or at least the ones I have certainly do. A normal iron iron shaft would be VERY loose in there. I'm not sure if a shim would work or not because I've not tried it, but there might be a problem if you decided to reshaft them. Perhaps someone on this forum has experience reshafting heads made for aluminium shafts with iron shafts. I was always a Bob Murphy fan, but he didn't win 5 tournaments in 1967. 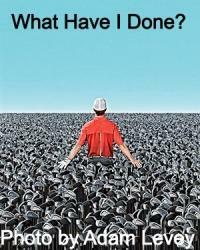 He won 5 his entire PGA Tour career. 2 in 1968, then 1 each in 1970, 1975 and 1986. 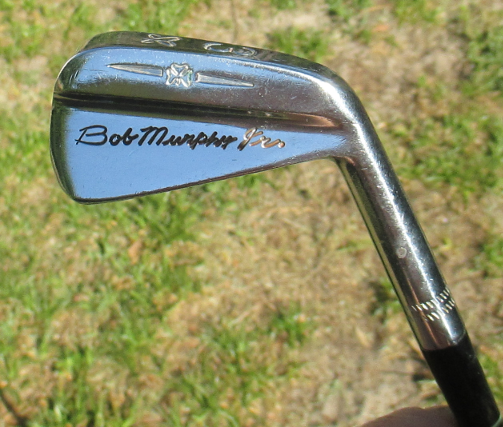 There were thousands of clubs with Bob's name on them manufactured and sold by Northwestern during the 70s and 80s, but the ones pictured above predate those. Golfcraft was the manufacturer for Sears golf clubs for many, many years. Golfcraft was later taken over by Titleist when they shifted from exclusively golf balls, gloves and accessories, to also producing golf clubs. I had heard that before, but I wondered if it was still the case when a lot of Sears products started carrying Arnold Palmer's name. I thought perhaps Palmer's company started supplying product at that point. The story was that Palmer's pro line company was very likely harmed by that deal as club pros who were trying to sell Palmer's pro line product resented the fact they were having to compete with Palmer branded clubs being sold at Sears. Later on in the 70s the Sears clubs had the words "Advisory Staff" on the back. The forged model looked like it could have been produced by Ram as it very much resembled the Ram Fastback model of that day with its wide sole and very square toe, but I don't know if that was the case. I’ve learned that if the set doesn’t have at least 5 to P I don’t fool with it. The 9 iron seems to be the club that is missing if one is. 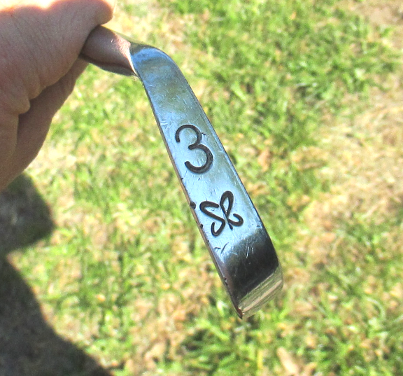 I was very happy to get 2 thru 9 iron set despite no wedge (sorry, I only showed the one in the picture), as I've got Pitch wedges coming out my ears and tend to bag wedges differently than my otherwise ?-thru-9 matched sets of irons. Even cooler would have been a 1 iron for novelty but I can't wait to try to hit this players' style 2 iron after I get a little better at the range. This set was a fun surprise and if adapters for the hosel bores is an issue trying to switch out the aluminum shafts, well, at least I live in Florida where I don't have the problem of them stiffening up in the cold. I do wonder if aluminum shafts work harden worse than steel by being used and flexed back and forth...(?)... but the main complaint I see about them was breaking because of temporarily hardening and stiffening while in the midst of cold weather real-time. I do have a friend in a machine shop I used to work for just up the road, too, who can whip out stuff real quick on a lathe instead of trying to use flat shim. Could the JR stand for Junior clubs? Are they shorter and have lighter shafts? I do wonder if the aluminum work hardens after ample use, but I only intend to use them occasionally. If I ever need to swap them out I can have my buddy make some adapters on the lathe; this being since, as the gentleman mentioned above, they're fat. I just finally put the calipers to them an right at the hosel the shafts come in as a whopping .430", LOL.